If your interested in volunteering for our "Baby Days" life enrichment initiative then you have come to the right place! you can sign up for locations that are offering this amazing experience for you and you baby to go and volunteer an hour of your time to put a smile on our seniors. Spending an hour with a senior is very beneficial to all who participate. 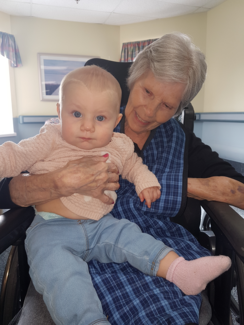 As research has also shown the benefits of people living with dementia have a higher level of positive engagement when interacting with babies or young children. They are also known to demonstrate a higher frequency of smiling and conversation when interacting with babies as well as preschool age children. I believe this is very meaningful volunteer work and will improve the quality of life for elderly in our community. Come enjoy some.timenwith these very special seniors. Come celebrate spring with these seniors who could use some of the sunshine your babies bring! Giving the gift of joy is pretty special! Come spend some.time with these lovely seniors! Come see how sweet these interactions are. Come check out this day program that is new to our list. Let show them the magic our babies bring! Come out and meet other moms while spending time with your favorite seniors?? Join in for an hour of pure joy for all! Come join this wonderful group of seniors for an hour of heart warming fun! Come hang out with some sweet seniors! It will make your day! See what it means to fill your heart. See what a smile from your little can do! See what the simple gesture of bringing your baby to visit does! (Main building) come spend an hour singing and dancing with our sweet seniors! Sign up with your little to make a seniors day! Come join us for a visit at this new home lets shoe them the power of love our babies have! See for yourself what a difference an hour makes! Come visit this new home and show them the magic our babies bring! Come check out this new home! Let's show them the power of love our babies bring! Share some love and fill your heart! Come and join these great group of seniors for an hour and watch the smiles light up the room! Join us for an hour of pure smiles, laughter and joy! Come spend an our making these wonderful seniors lives!! Come out give it a try you will be glad you did! Come out and spend some time making someones day! Share in filling the hearts of your local seniors. Seniors in need of some extra love! Join us for an hour of pure magic! Come spend some time with a group of wonderful seniors. Come make a seniors day! The joy your babies bring has no words. Come play with us while taking a seniors day! Small group with lots of love to give! Come enjoy all the love the seniors have for our babies! Make someones day brighter in one hour! Spend today making someome elses! Come and spend an hour getting to know a local senior and make their day! Join us for a super sweet visit with our most cherished generations! Come out and fill your heart and theirs too! Join in the fun and leave with a full heart.